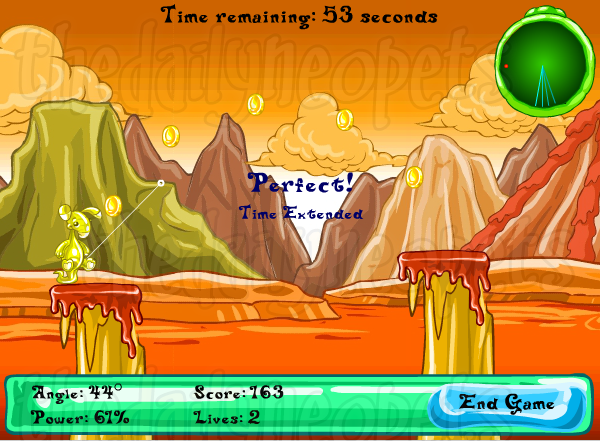 In this game, you play as a Jelly Blumaroo who has bounced too far from home and wants to get back. Unfortunately, an evil Pterodactyl has decided that the Blumaroo will be his victim. 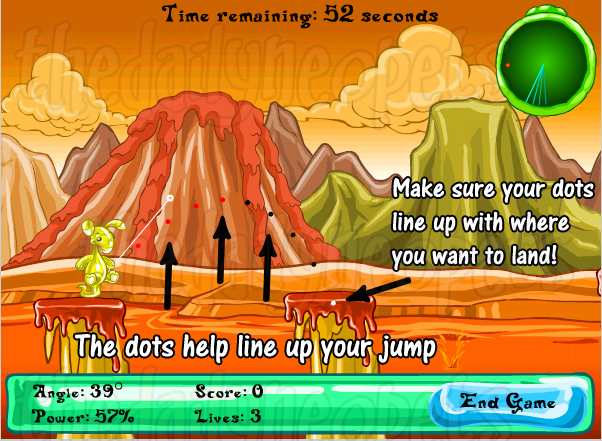 You must help the Blumaroo get home without being eaten by jumping on pillars to get across the lava. Be careful not to fall in! The game itself is not linked in the Games Room because it is located in Jelly World, which of course does not exist . To get to it from the Games Room, you must add it to your Favorites list, which is in the bottom right of the Games Room main page. To jump, you must use the left mouse button. Moving is easy, but aiming so you don't fall into the boiling lava makes the task trickier. You aim by moving your mouse around. Time Remaining: How much time you have remaining to jump before the Pterodactyl eats you. Pterodactyl Clock: A countdown, just like the Timer. 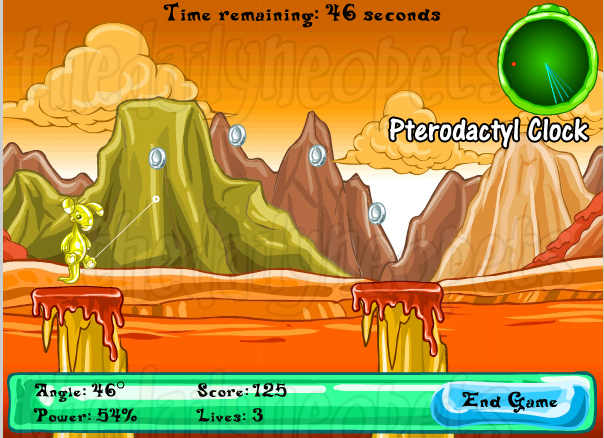 If the Pterodactyl eats you, it's instant Game Over. 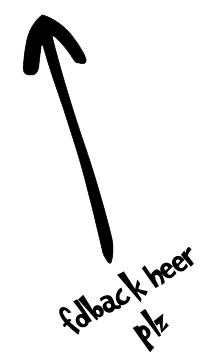 Angle of Jump: The angle of the jump. Power of Jump: How much power you put into the jump. Lives: How many lives you have remaining. You lose one when you fall into the lava. End Game: Option to exit instead of waiting for the timer to run down. During the first three jumps of the game, you get a line of flashing dots to highlight where the blumaroo will jump. The guide moves in repsonse to your mouse movements. You need one of the dots to touch the next pillar to land on it. Once a dot is touching the pillar, click to let the Blumaroo bounce. After those first three bounces, you lose the guide and coins start appearing. The more coins you get, the more extra time and points you are awarded. Don't make collecting the coins your top priority, though. It is more important to successfully land your jumps. 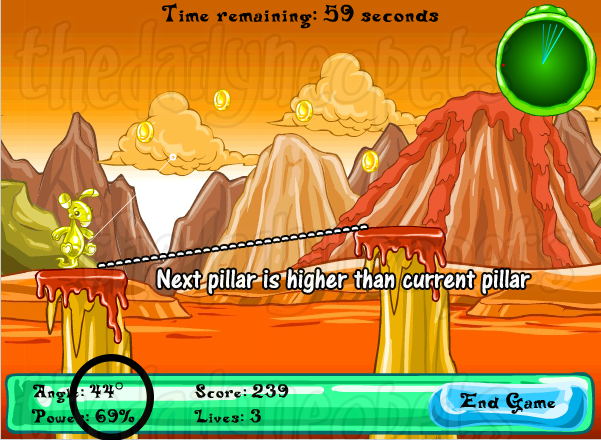 For many jumps, aiming between the first and second coins will result in a successful landing. A more accurate way to land successfully, though, is to pay attention to the Power of the jump and heights of the pillars. There are 3 general types of jumps you will have to make. These jumps are relatively straightforward. The Pillars are more or less on the same height. To pass these, you'll need to make sure that your power is between the 63-73% mark. In general, going less than 60 or higher than 75 will not end well. For these jumps especially, be sure you aim around the first two coins. Pillars that are lower than the one that you are standing on require less power to complete. They are relatively easy if you are following the correct percentages. 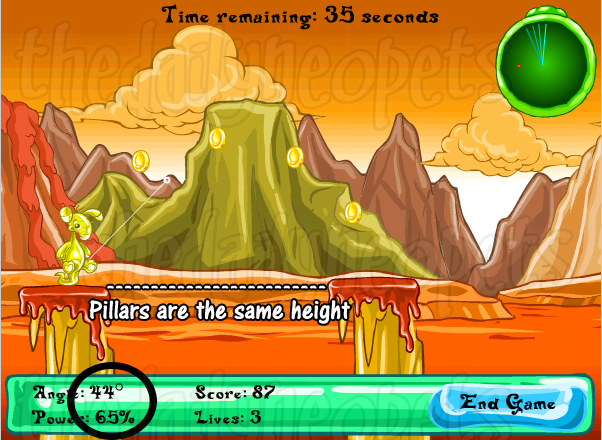 Here, you want to concentrate on percentages as opposed to "between the coins" because the coins are usually too high. Use 57-65% power and a slightly flatter angle. Some extremely low jumps can be done with almost no angle. Pillars on the higher tier can be a little trickier to make a successful jump onto. These pillars usually need 68-80% power. It's easy to be short on these jumps. 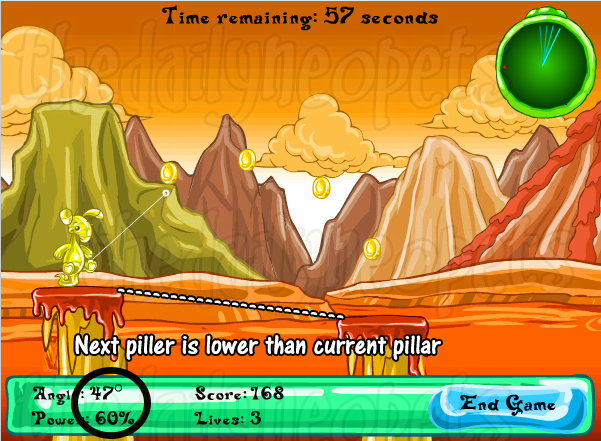 If you do a Perfect Jump, whereby you collect all of the coins and land on the pillar, you get extra time. The amount you are given depends on which type of coin you collected. 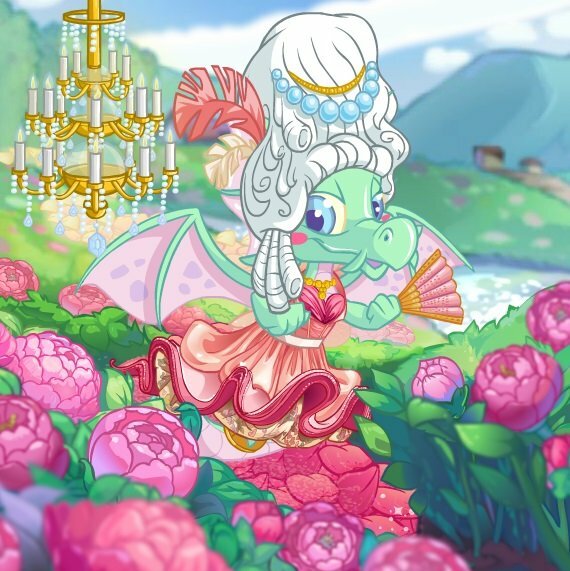 Gold coins are worth the most and give you between 5-6 extra seconds. You also receive a boost to your score. Once you can consistently land perfect jumps, your time will build up into the minutes so that you can take short breaks while it runs down. Building up time means you almost never have to worry about the Pterodactyl. If you are a visual person, it may help to visualize where the Blumaroo will jump based on the white aim line, recreating the dotted guide from the first few jumps mentally. You'll typically be able to do this with practice and familiarity with the game and won't need to rely on percentages for every jump anymore. Typing r turns the Pterodactyl Watch on/off, useful if seeing it distracts you. Type bouncebouncebounce for an extra life once per game. TNT has produced two MSN/AIM graphics for your use. To complete this game, you mainly have to watch the Power of your Jump until you get the feel of it. Since there is no finish line to the game, you can bounce to your heart's desire all day long!